April 1, 2013: Muskogee? Gesundheit! Are you looking for a big venue for your Car Wars mayhem? A really big venue? Then you need to get to the Muskogee Fairground & Family Emporium. Where might you find such a colorfully named locale? Why, friends, you need look no further than e23, where you'll find Car Wars Expansion Set 9 - Muskogee Fairground & Family Emporium. This handy-dandy digital humdinger includes information on the titular arena, which was originally presented on four full-sized maps, but in our electronic Eden also comes formatted for household printers -- spanning 60 sheets of paper! 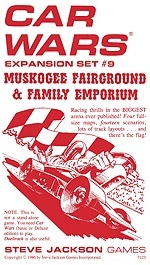 Enjoy your visit to the Muskogee Fairground & Family Emporium, where careful drivers are always welcome . . . to get out of the way of real autoduellists!